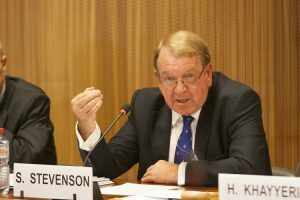 On July 5th, Struan Stevenson, Coordinator of the Campaign for Iran Change and former senior Member of European Parliament, published an article in UPI arguing that the European Union should not continue with the Obama administration’s policy of appeasement. Stevenson wrote of the massive public uprising that began in December of last year and spread to 142 cities and all 31 Iranian provinces. The uprising, which continues today, has swept up Iran’s 80 million citizens, half of whom are under the age of 30. Stevenson says that the people have made it clear through their widespread and continued protests that they are tired of fundamentalist rule and are ready for regime change. Stevenson wrote that the regime responded to the uprising in its usual manner, by sending the Revolutionary Guards (IRGC) to suppress the people. The IRGC shot dozens of protesters in the streets and arrested another 8,000. 14 of those have since been tortured to death in prison, according to Stevenson. The regime’s crackdown has not served its purpose. The people have only become more committed to overthrowing the mullahs’ regime, and public hatred for the regime has deepened in response to the brutal crackdown. Stevenson gave an example of the mullahs’ approach to justice with the recent case of Mohammad Salas, a 51-year-old Sufi bus driver, who was hanged by the regime on June 18th. Salas was arrested on February 19th at 2:30 PM outside of a police station, which was the site of a peaceful protest by thousands of members of the Gonabadi dervish community in Iran. The regime responded to the protest by first using a water cannon and then firing live ammunition at the protesters. According to Stevenson and multiple other accounts, in the evening hours, the protest became more violent and a bus veered into a group of police officers, killing three of the officers. The regime, desperate for a scapegoat, accused Salas of the crime, even though he had been arrested hours before the incident occurred. He was brutally tortured, with his fingers, ribs, and teeth broken, and he was taken to a hospital unconscious. After he regained consciousness, he was forced under duress to sign a confession, which he later retracted. Stevenson wrote that Salas was executed by a crane by the regime despite protests of his innocence and a massive campaign by Amnesty International. After his execution, Salas’s body was taken hundreds of miles from Tehran and buried in a secret grave, preventing his family from having his body examined for signs of torture. According to Amnesty International, this was a case of vengeance, not justice. 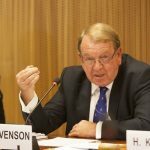 In his paper, Stevenson called for the EU to condemn this brutality by the Iranian regime and to adopt effective measures to compel the regime to release those imprisoned for taking part in the uprising and to end the arbitrary use of torture and the death penalty. Stevenson pointed out that Iran is responsible for half of the world’s executions and that many of those involve political prisoners and those who oppose the mullahs’ regime. Stevenson wrote that it is shameful that the EU should place more importance on trade and commerce than human rights. The people of Iran expect Europe to support them and to be on their side. Human rights and women’s rights cannot be ignored. The Obama administration’s policy of appeasement cannot be blindly followed by the EU any longer. According to Stevenson, it is dead in the water. Stevenson wrote that the Iranian regime cannot survive. The Iranian people will no longer allow the regime to plunder their nation’s wealth and turn Iran into a pariah. The uprising that is currently taking place has shown a new force of Iranians who are willing to give their lives for the cause of freedom and equality. Stevenson believes that the people of Iran are now capable of overthrowing the corrupt theocracy. Stevenson concluded his paper by praising the National Council of Resistance of Iran (NCRI) and the MEK, the primary members of the democratic resistance movement in Iran. The NCRI and MEK, led by Mrs. Maryam Rajavi, have called for an end to the corrupt regime and a new era of freedom and democracy in Iran. The NCRI and MEK seek to restore peace, freedom, human rights, and women’s rights, and they seek to end the practice of torture and the death penalty. They seek an end to Iran’s nuclear program and foreign meddling. Mr. Stevenson wrote that Iran is on the edge of a volcanic eruption of change. The people of Iran are ready for that change.